Yesterday, Rob attended a short presentation at the Cathedral about the displayed Lindisfarne Gospels. Lindisfarne is not far from Durham and the two have a close historical connection. Currently on display is the work of monks and is representative of the intricate work of illuminated Scriptures of the 7th and 8th centuries. See more about the current display here. The introductory pages to the Gospel of Luke. Notice the intricate work, all done with quill and ink. Wow. And kids today complain about writing in cursive! The presenter brought a facsimile copy that has been made available to curators and researchers. The text of the Scriptures are in Latin. In between the Latin lines the monks later added the Anglo-Saxon translation. Historians say that this is the oldest surviving translation of the Scripture into English, dating from the 10th Century. Even handling a facsimile copy was awe-inspiring. It is powerful to consider how God’s Word has been preserved throughout the ages. He was at work in the hands of those who preserved the text then, and at work around the world now. Today’s post includes pictures from other websites as photography was not allowed in the Cathedral. 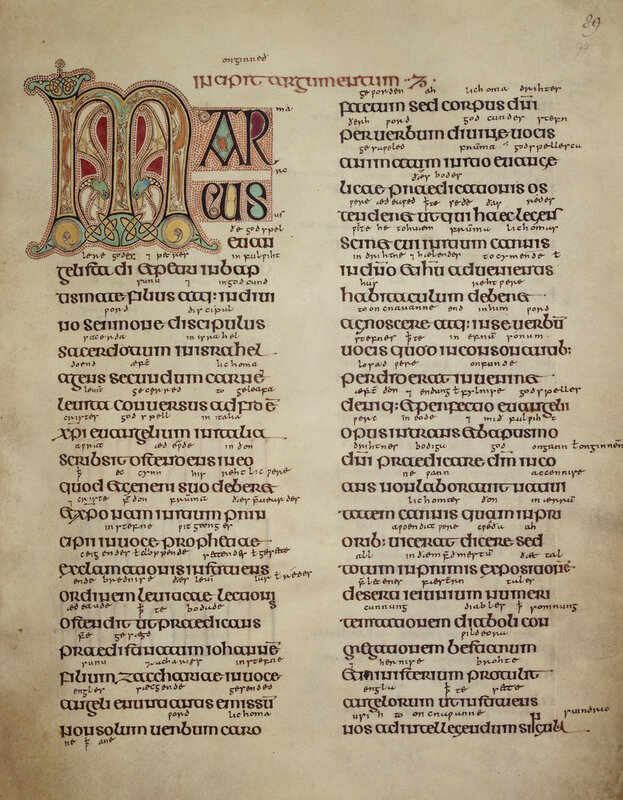 The first page of Mark’s Gospel. Notice the Latin and Anglo-Saxon translation written between lines. You wonder how they ever did these. They are beautiful.